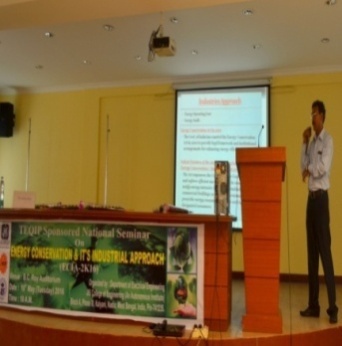 International Conference on Non – Conventional Energy ICONCE 2014. 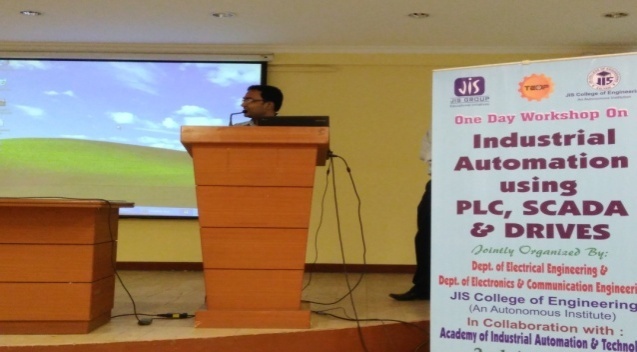 One day workshop on Industrial Automation using PLC, SCADA & drives for pre final year students. a) To provide a platform for our students to give information in relation to latest developments and development activities in Industry incorporating various Energy Conservation Technique and Implementation. b) To provide its related and enabling technologies regarding research innovation. Accredited Energy Auditor.BEE. (Govt of India). Certified Energy Manager(BEE,Ministry of Power, Govt. of India). a) Student’s Knowledge enriched with practical data & present global statistics. b) Students acquired some ideas of application of these abundant resources for proper utilization, which will be benefited in future aspects. 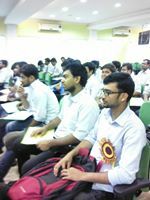 a) Students are very much interested to make B.tech. Projects considering this topic. c) Students and faculty members should have some knowledge about present energy crisis scenario and how to minimize this crucial situation and optimized application of energy. a) To provide a platform for our students to give information in relation to latest developments and development activities in Industry incorporating various Automation system namely PLC,SCADA and DRIVES. 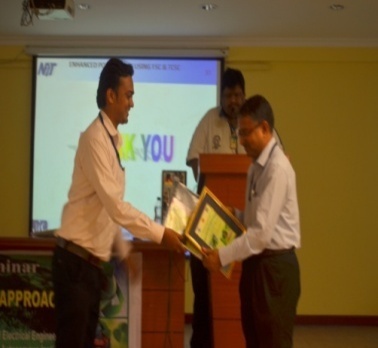 b) Students acquired some ideas of application of these modern automation system for Industry Application. a) To provide a platform for our students to give information in relation to latest developments and development activities in various application of solar & wind energy. JIS College of Engineering, Kalyani. 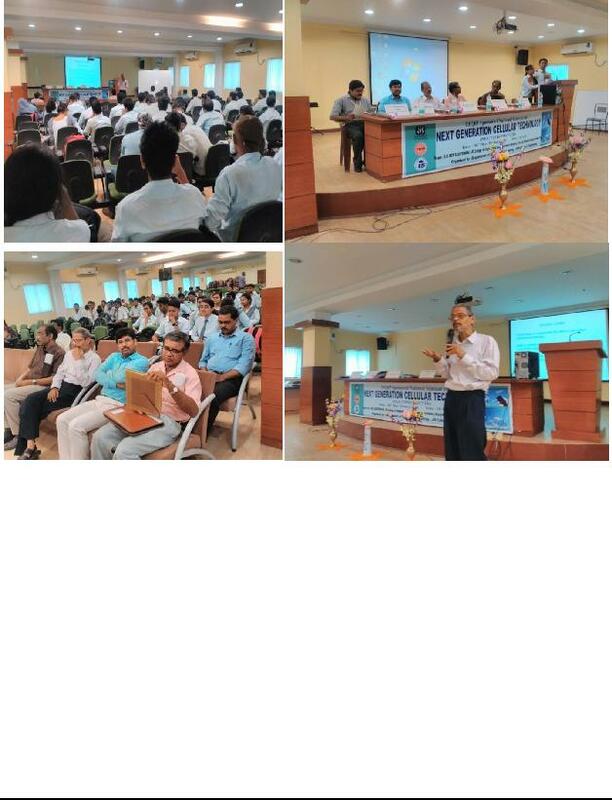 a) Students are very much interested to make B.tech. Project on this topic. c) Students and faculty members should have some knowledge about present demand and resource capacity of this energy. Objective: The topic of the seminar is related to the modern technological development in electrical engineering. The seminar will enhance the subject knowledge of the students as well. Principal, Kalyani Government Engineering College, Kalyani, W.B. 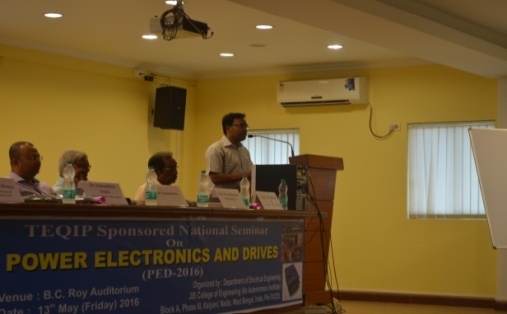 Both theoretical and practical aspects of power electronic converters are discussed in the seminar by the invited speakers who are from academic and industrial field. Faculties, technical assistants & students have got the chance to enhance their knowledge on the field. Inter speaker discussed the applications of power electronics in power system who herself has completed her doctorate degree very recently in the field. i) Increase innovative research idea among the faculty, staff and student. ii) Students get to improve their knowledge beyond the syllabus. A Next Generation Network (NGN) is a packet-based network able to provide Telecommunication Services to users and able to make use of multiple broadband, QoS-enabled transport technologies and in which service-related functions are independent of the underlying transport-related technologies. It enables unfettered access for users to networks and to competing service providers and services of their choice. It supports generalised mobility which will allow consistent and ubiquitous provision of services to users. NGN is a layered architecture consisting of transport, access, control and application layer. It is important to note that all the layers are independent from each other. Change in one layer should not affect other layers. Access Layers is responsible for direct subscriber attachment function. NGN can support all kind of existing access as well as upcoming access. In fact NGN does not matter about type of access. NGN is capable of processing traffic originated from PSTN, GSM, CDMA, xDSL, WiMAX or any other access system. Depending upon the type of access, protocol conversion and/or media conversion may be required at the NGN Gateways. Access Layer consists of Gateways. Example of getaways are media Gateway, Access gateway. Signalling gateway. Media gateway terminates media, coming from PSTN/PLMN in E1 / STM. Here it is responsible for packetisation of media under the instruction of control layer. After packetisation of information it throws packets to the transport Network. Access gateway is nearer to subscriber. Subscriber can directly be terminated in Access Gateway. All the required configuration of such subscribers should be done at control layer. Access Gateway and Media Gateways are responsible for carriage of Media whereas Signalling gateway is carrying signalling generated by PSTN and informs Control Layer about the signalling in required format. Transport Layer of NGN is based on IP. It can utilize the advantage of MPLS. Transport Layer forms the core of the Network. It basically consists of Routers, which are responsible for carrying traffic originated by access layer. As the same core network is going to be used for all kinds of subscribers enjoying different kind of real time and non real time services, it should be able to make use of band width policies and Qos policies. Operator has to think of managed Network for its subscribers. It is basically an assembly of routers connected with optical network. Traffic coming from gat ways is properly routed by those routers. It is responsible of call setup, routing and charging policies and other controls in NGN environment. It consists of call servers where all information of the network resides. These call servers are responsible for setting up, modifying, charging and tear down of the calls. NGN may work on soft switch principle. It consists of MGC (Media Gateway Controller) as an overall controller and MGs(Media Gateway) for termination of traffic. MGC is basically a server and it is having all the necessary information of network MGC instructs MGs for establishing the call. Under the control of MGC, MG performs different call related tasks such as connection, modification and termination of media streams, packetisation of media etc. It is responsible for OSS/BSS. Enhanced services to the subscribers will be provided with the help of application servers. It may include prepaid servers, announcement servers, Service servers etc. Hence NGN is making service separation from Network. Any service can be introduced with the help of server at any time without any modifications in the control, transport or access. Students get extra knowledge and information about next generation cellular technology. They got extra beneficial ideas beyond the syllabus. Outcome: Major Outcome of All students are feedback that this type of seminar will be arranging regular basis. 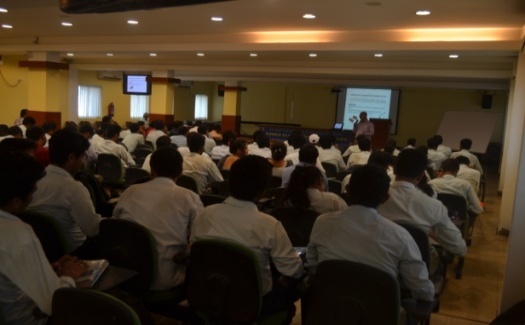 All students are agreed that seminar is full of new ideas, technology development which will be helpful further. ii)Students also get new technology beyond the syllabus which will give extra advantages to build their career. Main objectives of the event: This seminar provides opportunities for our beloved student to exchange new ideas and application experiences face to face, to establish business or research relations and to find global partners for future collaboration. 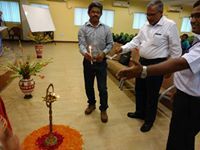 To this end, the seminar aims to attract participants with different backgrounds, to foster cross-pollination between different research fields and to expose and discuss innovative theories, frameworks, methodologies, tools and applications in High voltage engineering in power system aspects. 2) Prof.(Dr) Priyaranjan Mandal. Associate Professor, Head of the Department Department of Applied Physics,University of Calcutta 92, APC Road ,Kolkata.700009. Benefits obtained by students : Students get extra knowledge and information about high voltage engineering. They got extra beneficial ideas beyond the syllabus. i) Student gets idea and recent development of High Voltage Engineering. ii) Students also get idea and recent developments of Extra High Voltage Engineering.